The CIN code, or Craft Identification Number, is an important item of a boat or yacht. It is the chassis number and the boat registration number at the same time. The CIN code is unique for every boat or yacht and provides valuable information. 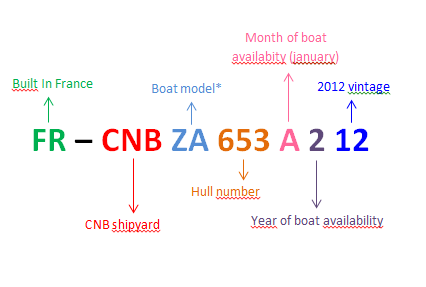 Every motor boat or sailing yacht built after 15 June 1998 must have a CIN code. The numbering system is mandated by the European Recreational Craft Directive and descended from the American Ship Hull number system (HIN). The CIN code consists of 14 consecutive characters, a dash and without spaces. An example CID/HID might appear as "FR-CNBZA653A212", where "FR" is the ISO 3166-1 country code for France, "CNB" would be the Manufacturer Identity Code (MIC); "ZA653" would be boat model* and the six hundred and fifty-third hull constructed by the manufacture; "A2" would be January 2012 for the date keel was laid to the nearest month and "12" denoted as the year 2012 as the particular model/specification number. Months are denoted from A…L for January…December. *Since early 2016, the boat model has been formed of two letters (for example the Lagoon 380 #135: FR-CNBZA653A212). It was originally made up of two numbers (take the same example: FR-CNB38653A212). In the United Kingdom, the British Marine Federation manage the issuing of Manufacturer Identity Code on behalf of the British Department for Business Innovation and Skills. Amateur boatbuilders should apply to the Royal Yachting Association for a five digit number which is then used with the GB country code and MIC ‘RYA’. Where do I find the CIN code? The CIN code or Craft Identification Number on all boats and yachts built after November 1, 1972 is permanently affixed to the rear of the transom usually on the upper starboard corner. It is required by the European Recreational Craft Directive and must appear on the registration application.